How Many Owners of Boats Over 40 Feet? I do not ask this question in an attempt to segregate the membership or to see who is "worthy" or anything, but I just wondered how many membes of THT own boats over 40 feet LOA. Just curious, that's all. If I turn out to be one of only a handfull who do, it's no big deal as I also have six boats from 10-22 ft myself. Please don't think I'm attempting to prove my superiority over anyone here in any capacity. I asked this question on another forum and was viewed as a snob for having asked in the first place. I just told them that sometimes certain things come up when you own a bigger boat where owners like to exchange info with like-sized boat ownership in common. Kinda like going to a Ford pick up truck forum and trying to get info on a Mack. I have both, but many F150 guys don't know or care about Mack trucks! Please don't fuss at me for asking this queston! Re: How Many Owners of Boats Over 40 Feet? Maybe you should ask, How many have boats under 40ft??? 90 % of the registered boats in the US are 20' in length or less. My guess 40' or more is less than 2% of total registered in US. This board's big intereset is outboards on CC and fishing. Neither are my cup of tea, but most of the folks here are nice and I've learned a lot. I wish mine was as big as yours. Danm son, now that's what I call ready for anything!!! Is that a Toyota dually? Now don't go getting yourselves all excited because I'm not trying to prove anything or trying to compare boat length to quality of membership on here. I suppose I could have asked how many folks have boats under 40 feet but then I'd have to do a whole bunch of gozintas to figure out who was left who either had a boat over 40 or just didn't care about talking about this. Looks like me and Dave are gonna have to watch our wakes on here! Seeing that boat in the back of the pick up reminds me of a car crash I witnessed a few years ago. A fellow pulling a bass boat behind his pick-up truck T-boned a guy who turned in front of him. It was like slow motion watching that bass boat slide up over the winch on the trailer, up over the tailgate, and finally coming to rest dang near like in your picture with the bow on the roof of the cab and the outboard hanging over the tailgate! I ain't kiddin', that's a true story! Yep, that was me. I drove off with his boat! I have found nothing but nice folks on here so maybe I need to change my signature and show a picture of Ryan riding on my WaveRaider, Whaler, or Lowe deck boat! I've got a picture of him holding up his first Largemouth Bass. Maybe I can get one of him holding his first fishing rod I bought him last year too. I wanted to get him a closed faced Zebco or something, but he wanted a "lellow" spinning outfit because the handle on the reel turned both ways! Heck, we ride that jetski as much as anything else. He just fusses at me for going too fast! Would ya'll like me better if I take down all that stuff on my signature and put up a picture of me and the young 'un paddling my Gheenoe down a mountain river? Relax man. Your sig is your sig. It's not the boat you have it's the input to the forum that counts. I've got a couple of other boats that I'm seen on from time to time but the longest is still 8.5 ft short of yours. I'm not braggin or nuttin. Man I love that center console. 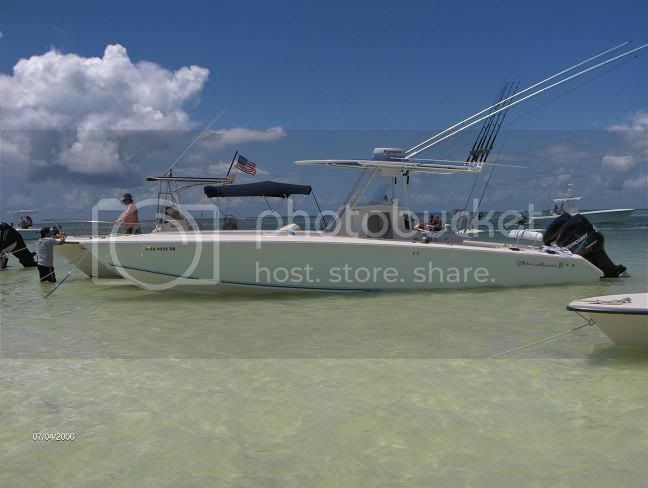 Short of my little Boston Whaler, I've never had one. 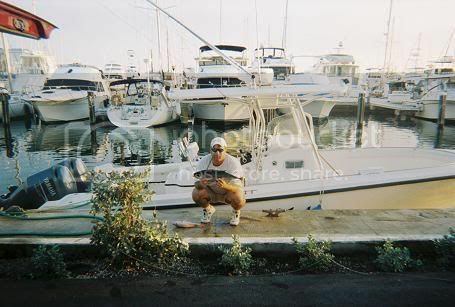 Maybe if I find myself in Florida for good I'll see if I can find a good one, but heck I would have to pay for for a late model boat like yours than I did my old Hatteras! Ain't no way I'd trade my old Hatt for a cc though! Remember, it is not the size of your boat, it is the size of you heart and sense of humor, and when can we hitch a ride on your meg-a-yacht? LOL I assume you are a delivery Captain or a boat thief! How the heck do ya'll give the smiley emoticon a toothless smile? Makes me feel right at home! Yep, I used to have one of those floating houses too. I felt the need, THE NEED FOR SPEED! Son, that is music to my ears! I used to be poorer than dammit but when I started making more money than I was supposed to my buddies bailed on me. I would show up in a big boat and try to load everybody up to get out and have some fun and drink a cold one or ten, but they would all just blow me off. Ten minutes later, somebody would show up in a pontoon boat with the same offer, and they wouldn't even waive goodbye when they left! Small towns breed small minds. I got accused of being a drug dealer instead of just being a good ole' boy who was in the right place at the right time and did good! I hate to ride around by myself and I'm always happy to load up a bunch of folks who just like to get out on a boat on a nice sunny day! Yep, I used to be a speed freak and still am. If things happen to work out with the misses, I may just get rid of my two Hatts and settle in on a big Fountain with generator and air or more likely a Wellcraft Excaliber. That way I can have speed, comfort, and the ability to trailer the thing to wherever I want to boat ride. I've trailered a 43 Scarab Thunder Series with triple 525SC MerCruisers. It was as much fun to pull down the road as it was to ride on the water. Some of the best boat rides I've ever had were when the boat was till on the trailer in a parking lot! Check out CPT Johnny's bad arse Fountain Sport Fish. Awesome boat.